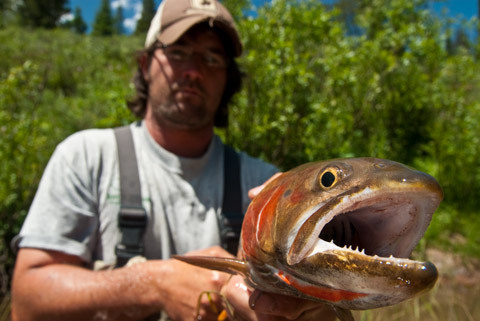 Ancient peoples in what would become Utah used Bonneville cutthroat as a primary food source. Settlers in Utah also relied heavily on Bonneville cutthroat to get them through the first few years. The Bonneville Cutthroat Trout was the victim of wide-spread over-fishing, competition from non-native fish and habitat degradation. In fact, only a few decades ago the Bonneville Cutthroat Trout was thought to be extinct and/or genetically compromised in essentially all of its native range. Today Bonnies are on the rebound and offer some incredible angling opportunities in waters just minutes from major urban centers and in some much more remote places most anglers would never go. Weber River: Special fishing regulations are present in portions of the Weber River Drainage so check the Fishing Guidebook before planning a trip. The Weber River from the confluence with the Ogden River upstream to Echo Dam is managed by the UDWR for native cutthroat trout (Bonneville/Bear River cutthroat trout). The Weber River and its’ tributaries from the town of Oakley, UT upstream to the headwaters is managed by the UDWR for native cutthroat trout (Bonneville/Bear River cutthroat trout). Beaver Creek (upstream from Kamas) is managed by the UDWR for native cutthroat trout (Bonneville/Bear River cutthroat trout). South Fork of the Ogden River is managed by the UDWR for native cutthroat trout (Bonneville/Bear River cutthroat trout). Wheeler Creek. 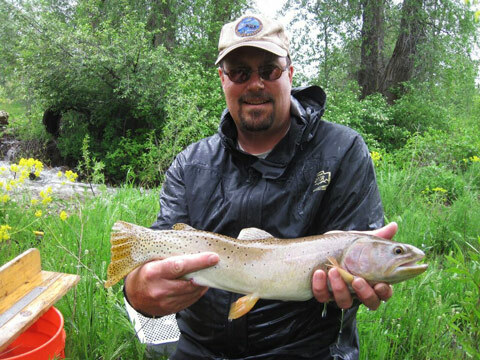 Angling conditions can be tough as Wheeler Creek is a small, brushy stream that is managed by the UDWR for native cutthroat trout (Bonneville/Bear River cutthroat trout). Wolf Creek. Angling conditions can be tough as Wolf Creek is a small, brushy stream and is is managed by the UDWR for native cutthroat trout (Bonneville/Bear River cutthroat trout). Northern Wasatch Front streams: The UDWR Northern Region Office has restored native BCT to several of the small streams along the Wasatch Front north of Salt Lake City. For more information on these angling opportunities, call the Northern Region Office at 801-476-2740. South Fork of Little Deer Creek (downstream from Deer Creek Reservoir). Angling conditions can be tough as the South Fork of Little Deer Creek is a small, brushy stream. Little Dell Reservoir (including Little Dell Creek). Because this is a BCT brood source, these waters are catch and release for BCT and artificial flies and lures only. Lambs Canyon Creek. Angling conditions can be tough as Lambs Canyon Creek is a small, brushy stream. Southern Wasatch Front high mountain lakes: Many of these lakes require a 2-3 hour hike on a good Forest Service trail in order to access the lake. Little Cottonwood Canyon lakes (White Pine Lake, Red Pine Lake and Upper Red Pine Lake) are managed for BCT and stocked frequently. Diamond Fork River headwaters including the tributaries Shinglemill, Chase, and Halls Fork creeks. These streams were restored to BCT in 2006 and are protected from non-native trout by a barrier. Right Fork of Clear Creek (tributary to Soldier Creek). Angling conditions can be tough as the Right Fork of Clear Creek is a small, brushy stream. Deep Creek Mountains (eastern slope): These are extremely remote, small, brushy streams that terminate at the valley floor. These streams can be accessed from the valley floor by a dirt road and most have poorly defined trails along the streams. For more information on angling opportunities in this mountain range call the UDWR Central Region Office at 801-491-5678. 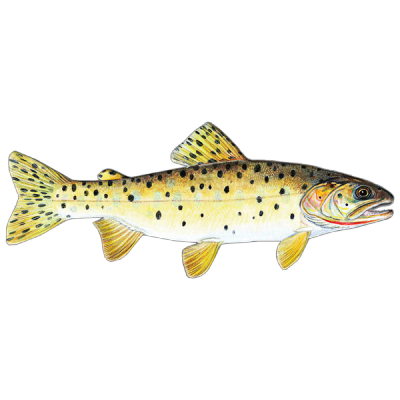 Salina Creek: the reach upstream from Interstate 70 will have more pure fish as rainbow trout occur downstream. Clear Creek and tributaries (65 total stream miles) now contain BCT after extensive restoration efforts. East Fork Sevier River in Black Canyon, upper Sevier River, and Asay Creek near Hatch are stocked annually with BCT. Southern Utah Lakes – BCT are stocked annually in Manning Meadow Reservoir, Barney Lake, Pine Lake, Yankee Meadow Reservoir, Upper Enterprise Reservoir, and all three Kent’s Lakes on Beaver Mountain. Designated official state fish of Utah in 1997, replacing the nonnative rainbow trout.